Boyle’s Latest Attempt is Full of Riches! Danny Boyle is back, folks! Back to Oscar form, that is. Despite the mixed reviews he got for Sunshine, he’s come back with something that will be hard to resist for most critics. At its core, the film is a feel-good story with turbulence brought on by the intense catalyst that actually pushes the film forward. So basically “without trial there’s no absolute happiness”. Boyle’s take on the wonderfully written material (brought to you by Simon Beaufoy) incorporates his traditional gruff and hard hitting storytelling through contrasts blended with his new found love for style. Coming with this style is Anthony Dod Mantle’s wonderful cinematography, which incorporates a lot of Dutch tilts in most of the montage/fast cut segments. His work is bold and brass, cremé de la cremé in terms of street-stricken cinematography. 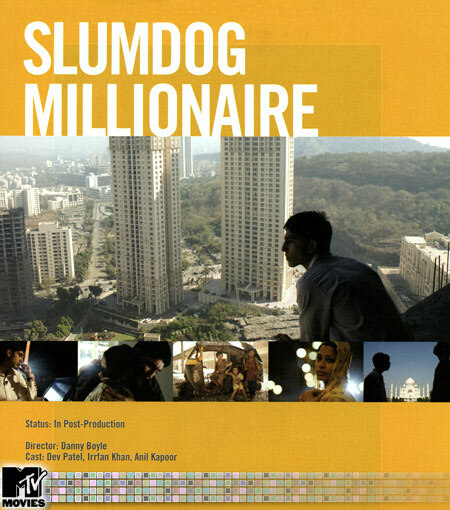 The film features style akin to City of God’s – vibrant and over exaggerated color schemes are used to pump life from the ghetto where the film predominately takes place. Actually, this film is a lot like City of God now that I think about it: jumping back and forth between time with transient and alert editing (Chris Dickens), a high-tempo, adrenaline-filled score deeply routed in the country’s musical sounds (the movie was scored by A.R. Rahman). Also, Boyle’s use of juxtaposition between the slums and the upper class (albeit, there isn’t much upper class in the film – I’m speaking mainly of how sleek the gameshow is compared to the slums) is amazing; perfect contrasting. All in all, Danny Boyle creates a pitch perfect atmosphere for the film to thrive in. His best work since ’96’s Trainspotting (and even I wouldn’t consider that work better than his work in this film). Simon Beaufoy (writer of The Fully Monty) adapted the novel Q&A (written by Vikas Swarup) to the screen in the form of this film. Beaufoy’s toys with irony beautifully and creates three dimensional characters, where a lesser writer would’ve left monotonous and simplistic ones. This is my favourite script of the year – it’s absolutely flawless. So since the plot has yet to have been discussed in much detail, I’ll give you the 411: The film revolves around a controversy when a contestant of “Who Wants To Be A Millionaire?” is exceeding the previous record about fifty fold. Because the producers feel as if this contestant is a cheater, they take him into a desolate and seclusive place to question him (and torture him) about how he knew all these answers. Turns out this man, Jamal Malik had experienced the answers to all of these questions somewhere in his life when he resided in the slums of India. Through intense questioning from a stern police inspector (played by Ifran Khan) we relive Malik’s past life experiences. We jump between his life as a youth (about six years of age), teen years (about fourteen or so) and current life (twenty or so) to see how he’s come across these answers. When we aren’t in the midst of Jamal’s life, we see him in the actual “Who Wants To Be A Millionaire?” gameshow. The host of the show is Prem Kumar, a greedy, skeptical type of man, who allows his on air persona to wash away any actual emotion he may feel. The host is one of those “could’ve been a plain character” situations. Anyways, the film is a sometimes funny and sometimes disturbing – but always gripping – story of a young man’s triumph over the ghetto is one of this years main tickets.